As Thanksgiving approaches, it is a wonderful time to reflect on the year and what we are thankful for. As an organization, we are so thankful to be able to provide a life changing and meaningful service to others through horses, but we certainly cannot and do not do this alone. When starting a Non-Profit Organization, otherwise known as a 501 ©3 the passion and drive is already there but, there are many important things to take into account. What is our mission? Who will we serve? What makes us different from other programs? Who will sit on our Board of Directors? (I’m sure you get the idea here.) A very important factor is how will we raise money and become sustainable? This is one of the biggest challenges and what we are incredibly thankful for on this Thanksgiving and every day, our donors and supporters. Because of you, we are able to provide our Mental Health services to Veterans who suffer from PTSD and their families, youth and women who have suffered trauma, abuse and neglect at NO to very LOW cost. If you have donated to our organization, attended events, sponsored a horse, promoted us on social media, referred a client or became a community partner, WE THANK YOU! If you have given your time to our organization in any capacity, we are so thankful. When donating to our organization, you are providing a life changing experience to someone in need in our community. Mental Health is incredibly important, often overlooked and and we provide a way of delivering this service in a unique and powerful way. We could not take on this battle alone and we are so thankful to those who have decided to support our mission and those we serve. 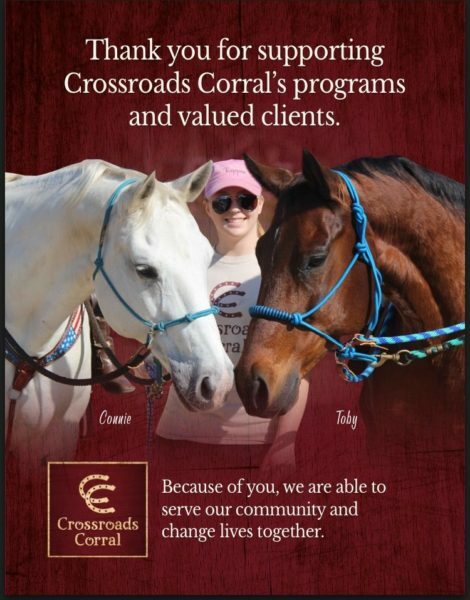 In this season of giving, we hope you continue to support Crossroads Corral and help us to fill in the gaps of mental health!